I’ve meant to read Trollope for a while. Actually ever since I’ve read Guy’s (His Futile Preoccupations) and Brian’s (Babbling Books) reviews of his novels. Most of Trollope’s books are chunky but The Warden, the first in the Chronicles of Barsetshire, is a mere 180 pages. According to the introduction, Henry James called The Warden “the history of an old man’s conscience”. That’s true, however, it’s only one of at least three major themes Trollope exlpores and which all contribute to make The Warden a highly worthwhile and interesting book and one of those you’d love to discuss with other people. Septimus Harding is precentor and warden of an almshouse. With these positions come 800£ per year. In order to obtain this money Mr Harding doesn’t have to work a lot. As a precentor he’s in charge of the choir in the cathedral and as warden he’s the moral support of the twelve destitute men who are allowed to spend their last years in the almshouse. Since the almshouse was founded in the 15th century, the warden has received more money every year because of the revenue of the land. The twelve men’s allowance however would have been still the same as in the 15th Century if Mr Harding hadn’t given them some of his own money. At the time when this story takes place, numerous reformers are hunting down greedy clergymen, showing how they abuse of their power and enrich themselves at the expense of others. Dr Bold is just such a reformer. When he meets the warden and his daughter, with whom he falls in love, he learns about the founder’s will and instigates an investigation which leads him to the conclusion that Mr Harding receives money that is due to the almsmen. His inquiry quickly gets out of hand when the biggest newspaper publicly accuses the warden of greed and malpractice. Mr Harding is an excessively private man. He’s weak but kind and good-hearted. Being dragged into the spotlight like this, accused and shamed, is more than he can bear. He never thought that he might be doing something wrong but once he starts to think about it, he’s not so sure that he wasn’t enriching himself at the expense of the twelve poor men. While he doesn’t want to fight the accusation, his son-in-law, archdeacon Dr Grantly and the bishop of Barchester, fight for him and soon both parties involve lawyers. The warden has another strong supporter in his daughter who begs Dr Bold to abandon the cause. The three themes which are explored each center on another figure. Mr Harding has to examine his conscience. Will he stay warden if it has been proven that he’s legally entitled to his money or will his own conscience tell him to let go? Mr Bold shows how good intentions at the wrong moment and without thinking about consequences can be fatal. Maybe Mr Harding gets too much money, but why make this a matter of public interest and involve the newspaper? Why does he disregard the peace and quiet that reigns at the almshouse? Neither Mr Harding nor the twelve men are wanting anything. They live together amicably but once Dr Bold tells the twelve men that they should get more money, peace is lost forever. For contemporary readers it might be interesting to read about the role of the press and the journalist Tom Towers. Trollope was inspired by true stories and what he lets us experience is the beginning of the value of public opinion and the power of the press. The warden’s garden is a wretched wilderness, the drive and paths are covered with weeds, the flowerbeds are bare, and the unshorn lawn is now a mass of long damp grass and unwholesome moss. I had a very strong reaction when I read how content Mr Harding was in the beginning and how quickly a lifetime of ease was destroyed. At the same time I had to agree with Bold. Not in this matter, but in general. Why would a clergyman be given so many riches, a huge house with gardens, and a large income without doing any work? Still, I was sad for Mr Harding who was threatened to lose everything he held dear, even though he might not have been entitled to have it. What annoyed me about Mr Bold’s doing was that the man he attacked was a kind and generous man and – compared to other clergymen – a tiny fish. Before ending this rather lengthy review, I’d like to say a few things about Trollope’s writing. I enjoyed the descriptions and I had to laugh out loud a few times when he characterized people, notably the archdeacon, using caricature and satire. I found many of his authorial intrusions interesting but there were too many for my taste. I had problems with the parodies of Carlyle and Dickens because they felt glued on and were not a part of the story. I didn’t mind that Trollope spoke to the reader directly but some of the more hidden intrusions were annoying. I’m glad I read The Warden. It made me remember my stay at Salisbury and I loved the descriptions. I liked his choice of themes and think they are just as important today as they were then. I also think he’s a wonderful satirist. Will I read the next in the series? In all honesty – I’m not so sure. I can’t pretend I fully warmed to Trollope and although I’ve started a small Victorian literature reading project, I think I’ll move on to Elizabeth Gaskell and the Brontës. If you’d like to read more reviews on Trollope visit Guy’s (His Futile Preoccupations), Brian’s (Babbling Books) and Tony’s (Tony’s Reading List) blogs. Brian’s reading and reviewing The Barsetshire Chronicles (here’s his review of The Warden). Tony has reviewed both the Barchester and the Palliser novels – and some more and Guy has written about many of the other novels. Thanks so much for the mention Caroline. Your review here is superb. One of the things that I love about Trollope is his complexity. As you observed, Mr Harding is probably receiving more benefits then he should be. But the situation and how the characters handle it is so nuanced and nothing is simple. Your personal experience with the Salisbury connection does indeed sound uncanny but also really neat. As much as I enjoyed this boom I think that the next in the series, Barchester Towers, is even better. Thanks, Brian and you’re welcome. I can see why you or anyone loves him because it was fascinating to read and analyse this but I’m not sure how I’d get a long with a longer novel. It spoke to me on one level but I couldn’t love the book. On the other hand, I thought that Trllope needs room. You can feel that. This is almost a sketch. Watch out, though – if you don’t like the intrusions, in Barchester Towers Trollope really lets it all out. There is almost as much stuff about how novels are made as in Tom Jones, except less well organized. It is amazing. I can only find one Palliser novel at Guy’s site. Guy, help, I want to read about Phineas Finn! That’s exactly my point – it’s not so well organized. What I found extremely interesting though is the many different categories of intrusions. He’s nothing if not diverse in that. So – hmmm in a way I’m tempted to see what he does on a larger scale. Sorry about Guy and the Plliser novels. my bad. I thought he’d reviewed the systematical. Maybe it was Tony? Hi, Caroline. I meandered my way through all of the Barchester Towers novels, and I believe that in order to read them correctly, that’s exactly what one needs to do, is to “meander” through them. They are leisurely, even when building up tension, and they are the picture of a place and a time, both of which are perhaps more characters than the actual characters themselves. To read them slowly and steadily (perhaps while taking occasional breaks from more fast-paced fare) is the way to get through them. 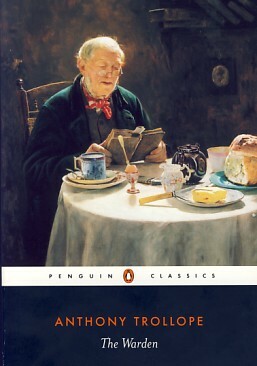 But if you want to read some more satirically pointed Trollope, you could read “He Knew He Was Right” or “The Way We Live Now,” whose similar style of titles betray another similarity as well, a terseness, economy, and lack of luxuriousness of the Barchester novels. In “He Knew He Was Right,” a husband gradually becomes undermined mentally by his own suspicions of his (innocent) wife, and in “The Way We Live Now” a satire of the nouveau riche is intended (though you should know that it is also a bit anti-Semitic). The BBC has excellent productions of both these in serial form (and I suppose therefore in DVDs). David Suchet (otherwise known as Hercule Poirot) did an excellent job of acting the role of the father in “The Way We Live Now,” and curtailed to some extent the anti-Semitism by playing the character fully and completely and not relying on stereotypes or caricatures. Anyway, Trollope apparently wrote tons and tons of things, and I don’t suppose most people even know the titles of the works concerned; I know before I saw the BBC productions, I never even knew he’d written anything but the Barchester Towers books! Thanks for your comment, Victoria. I think what you say makes sense and I’ll keep it in mind. He Knew He Was Right could be for me as well. I don’t think The Wy We Live Now would be for me. The anti-semitic element puts me off. I did feel the place was like a charcater and wouldn’t mind to revisit Barchester. Fascinating review. I worked in Salisbury for four years in the 1980s and it was indeed very lovely, particularly round the cathedral area – and at the time full of book shops (I have regularly lamented the loss of them). I have yet to get started on Trollope, and maybe this sketch, with its familiar setting, would be the way! Thanks, Karen. Id’ love to hear how you’d feel about the descriptions. I think that Salisbury was the physical inspiration while Winchester was more of a thematic inspiration. In any case it seems he got the idea while walking around in Salisbury one evening. I’m so glad I can finally put a name to my memories. It’s an odd thing to happen and qute odd how I finally found out. How sad about the book shops. I was there some ten years ago. I guess they didn’t exist anymore. the Warden is not so dauntingly long as the other books. A good starting point, I’m sure. I thought it was you after I saw Tom’s comment. I’ll add your blog to my post. I’m sorry. I don’t think I’ve actually read your posts but I remembered one of your comments on Guy’s blog. I’m not hooked yet – so Barchester Towers hmmmm. Sounds dangerous – from an addiction point of view. 🙂 Brian too, thinks it’s the superior book. Thanks for the mention Caroline. I haven’t reviewed all the Palliser novels, but I have reviewed some Trollope. I intend to read more over time. I was going to ask if you were intending to read another Trollope soon, but you answered my question. Trollope is someone I return to from time to time and I find his novels reassuring. One of my favourites, flaws included. I mixed you up with Tony. I thought you’ve read and reviewed most of the Palliser novels. Maybe The Warden wasn’t the best starting point. And I wasn’t prepared ffor him style wise. Now that I know it will be quite different. I was glad I could link it to Salisbury. It’s odd because it wasn’t that long ago but I must have walked around that place in a dreamlike state. Hmmm. I was on Bold’s side from a purely moral point of view but I don’t think the way he did it was right. I would have loved to write about the ending – maybe we get a chnace to discuss once you finish in “attention spoiler” comment. 🙂 I think it says a lot about Trollope and I do suspect he’s on the side of tradition. You’ll see what I mean. I’m tempted to read Barchester Towers. The intrusion of the author cheer me up – if only because they are so contrary to anything writing programs teach you. Wonderful review, Caroline! Glad to know that you liked your first Trollope book, though you love it. It is nice that ‘The Warden’ is only 180 pages – all the Trollope novels I have seen are chunky and so that is a nice thing. It is nice that the two main characters in the novel, though they are on opposite sides, are portrayed in a nuanced way with all their good things and flaws. The ending seems sad, looking at the passage on the garden you have quoted. I got the first novel in Trollope’s Palliser series ‘Can you Forgive Her?’ but I haven’t read it yet. It is quite chunky and so very intimidating, but I hope to get to it one of these days. Nice to know that you are planning read the Brontës now. I read Emily the Brontë’s ‘Wuthering Heights’ a few years back. Many of my friends said that it is one of their favourite books, and though I didn’t love it, I found it quite interesting. I will look forward to hearing your thoughts on the Brontë books that you read. It was interesting to read about the beautiful place you visited in England and how you discovered the name of the place through Trollope’s book. That is really fascinating. Our memory is so unpredictable and we can never say how it will surprise us next. I’m looking forward to hear what you think of Trollope. I would love to discuss the end of The Warden. I only spoilt it a little with that garden description. Tony’s reviewed the Palliser novels. I’ve read Wuthering Heights and Jane Eyre as a teenager and they are due for a re-read. But I’d like to finally read Anne Brontë as well. And mayn books on the Brontës. I never had a sense memory like this one and couldn’t say where I’d been. Strange. I didn’t so much mind Trollope poking along in his slow, perambulating narrative style, but Gaskell is a bit long-winded for nothing, to my way of seeing it. I haven’t read “Cranford.” And the Brontes seem to like to torture their heroines, which is a classic thing (it’s done by many Romantic and Victorian writers, male and female), but it’s off-putting, I think. All worth reading once, but I don’t think I will ever read Gaskell again, frankly. It’s important to remember that those who were writing for money considerations (Dickens and I think Gaskell, though Dickens made quite a bit of money at one time) wrote long, long novels for more than one reason, and Dickens was of course serialized before the novels were published as wholes. True about the Brontës but I love the atmosphere. I’m a bit of a Goth, you know. 🙂 And then again, didn’t they also torture their heroes? I’ve not read a lot of Elizabeth Gaskell, so it’s entirely possible I’ll not like her. I do not like long books usually anyway. Wilkie Collins is on my list too. Another writer I’ve read in my teens and whose atmosphric descriptions I loved. I’ve read ‘North & South’ (which really fell apart towards the end), but I quite liked ‘Cranford’ – nice and short, very good comfort reading. Gosh, I think I did read “Cranford”! I remember a book with it and novellas in it, anyway. Well, it won’t be the first time I was underwhelmed enough to forget that I’d read something, although the novella itself and the others with it were made into a rather gripping series on BBC called simply “Cranford,” as if it were all one novella. Geez, my memory is slipping! I know I wrote a post on something of Gaskell’s, too. How embarrassing if it was that! 🙂 I watched the BBC series a few years ago and then found out later that it’s a mix of all the novels in the tome “Cranford”. There are a total of four novellas. What happesn to me often is that wehn i read a book and the watch a series/movie I immediately forget the book. I have to have a look and find out what you read. I enjoyed your description of Salisbury, it made me want to go there one day. I got so caught up in it that at first I thought it was a passage from the book! I always say I should read Trollope someday. Perhaps this is a good book to start with. Thanks, Delia. It’s such a lovely place. And it has been used as a setting quite a few times. The last time in one of Cornelia Funke’s books, Ghost Knight. This one isn’t a bad start because it’s not as long as his other books. But there are some standalone titles that sound good too. Very interesting. Trollope seems to be the very model of a “marmite” writer, ie strong reactions for or against, with no room in between. He inspires the most ferocious loyalty and, at the same time, some of the most withering dismissals I have read. I’m not particularly inclined to try him, or at least not till I have more room in my reading plans. I can see why there are these different reactions. I don’t think I’ll read him again very soon. At first, after the comments, I was tempted but now I made a mental list of all the other classics I still want to read and will postpone him. I want to read this one, especially since it’s short. Guy recommended Miss McKenzie and I loved it. I remember that. I suspect I would love it more as well but I had this for a while. What a lovely review, Caroline. How cool that you were able to retrieve the setting in your memory by reading this book. I’ve meant to read Trollope for years and really need to get on that. Thanks, Carole. I think this isn’t a bad place to start but I remember when Emma reviewed Miss McKenzie – also a book that isn’t too long – 400 pages – it sounded very good. I loved how he captured the mood and atmopshere of Salisbury. I guess that’s why I could finally make the connection. I’m quite tempted to go back there but I’m also in a Brontë mood and would like to travel around Yorkshire. Decisions. I’ve been in York but didn’t visit the countryside much. I hope I get a chance this year. Interesting reactions, Caroline–both from you and in the comments thread! Tom & Tony recently recommended “The Warden” and “Barchester Towers” to me in response to a question about where to start with Trollope, so I’d like to give those two novels a try at some point. However, I’m not really exactly in any hurry and at the rate I read British novelists it may be a while. Hope you have fun with the rest of your reading project! It may not be as good as Barchester Towers but I’m sure it will give you a very good idea of his style and it’s short. I’m very curious to find out how you will react. My project is well on its way but I’ve started with nonfiction. How wild–talk about deja vu! It sounds like he does descriptions really well. I have long wanted to try Trollope and know this is a good place to start, but am still hesitant. It sounds like it is good, but maybe not swooningly great, but maybe if you keep going the stories get better as others say. Hi, Danielle. It’s a question, sort of, of what expectations you go in with. If you’re going to read the Barchester novels, you probably need to be in a frame of mind to live in a world for a while, not just read a book, because if it happens with you as it did with me, you’ll keep remembering things from the other books that seem to connect up with whatever book you’re reading, even if they seem to be on different subjects. Whenever I read a series of books like this, I like the feel of having a place to go, as it were! It’s pretty wild, right? I was so glad I could dig out the memory. I think Miss McKenzie might be even a better starting place and it’s not the beginning of a series. I’m tempted to read on but the books are so huge. I own this, but I suspect I’m with Leroy on it. The digressions sound like they would irritate me in my current mood, though moods change of course and at other times I quite enjoy that sort of authorial intrusion. I loved your paragraph on the issue of agreeing with Bold but being sad for Harding. That speaks to the quality of the book. Bold is right, clearly, but Harding’s offences are small and of omission and there must be much worse targets Bold could have gone for. Instead he’s gone for a kind man with failings, a tiny fish as you say. That’s realistic though isn’t it? How often do reforms hit some minor offenders who weren’t doing that much harm, while far more flagrant abusers of the system simply carry on untroubled, perhaps even leading the reforms into the practices they perpetrated. Everything must change, so that everything can stay the same. I found the intrusions mostly annoying. Maybe when you know what to expect it’s different. I’m certainly glad I’ve read it. It’s a very elegiac novel because it’s obvious that things have to change but the reader would have preferred it if Bold had chosen another person for his crusade. I suppose Trollope was on the Warden’s side, although he celarly saw that it wasn’t right. It’s very interesting too, that, in the end, it’s the Warden who chnages everything because he feels Bold is right. The end of privacy and the powers of newspapers is a major theme too. I hope you’ll read it anyway some day. I’d love to hear thoughts.